Note: Introduced in GitLab 8.9. The jobs assigned to these stages will run in this order. If a job fails, then the builds that are assigned to the next stage won't run, rendering the pipeline as failed. In our case, the test job will run first, then the build and lastly the deploy_staging. With this, we ensure that first the tests pass, then our app is able to be built successfully, and lastly we deploy to the staging server. The environment list under your project's Pipelines ➔ Environments, is where you can find information of the last deployment status of an environment. You can't control everything, so sometimes things go wrong. When that unfortunate time comes GitLab has you covered. 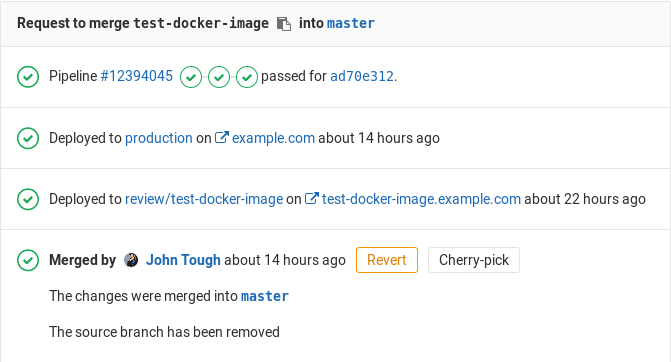 Simply by clicking the Rollback button that can be found in the deployments page (Pipelines ➔ Environments ➔ environment name) you can relaunch the job with the commit associated with it. The when: manual action exposes a play button in GitLab's UI and the deploy_prod job will only be triggered if and when we click that play button. You can find it in the pipeline, build, environment, and deployment views. Note: Web terminals were added in GitLab 8.15 and are only available to project masters and owners. If you deploy to your environments with the help of a deployment service (e.g., the Kubernetes service), GitLab can open a terminal session to your environment! This is a very powerful feature that allows you to debug issues without leaving the comfort of your web browser. To enable it, just follow the instructions given in the service documentation. Note: Container-based deployments often lack basic tools (like an editor), and may be stopped or restarted at any time. If this happens, you will lose all your changes! Treat this as a debugging tool, not a comprehensive online IDE. You can use Koding for online development. Let's break it down in pieces. The job's name is deploy_review and it runs on the deploy stage. The script at this point is fictional, you'd have to use your own based on your deployment. Then, we set the environment with the environment:name being review/$CI_BUILD_REF_NAME. Now that's an interesting one. Since the environment name can contain slashes (/), we can use this pattern to distinguish between dynamic environments and the regular ones. So, the first part is review, followed by a / and then $CI_BUILD_REF_NAME which takes the value of the branch name. Since $CI_BUILD_REF_NAME itself may also contain /, or other characters that would be invalid in a domain name or URL, we use $CI_ENVIRONMENT_SLUG in the environment:url so that the environment can get a specific and distinct URL for each branch. In this case, given a $CI_BUILD_REF_NAME of 100-Do-The-Thing, the URL will be something like https://review-100-do-the-4f99a2.example.com. Again, the way you set up the web server to serve these requests is based on your setup. When you have an environment that has a stop action defined (typically when the environment describes a review app), GitLab will automatically trigger a stop action when the associated branch is deleted. As we've seen in the dynamic environments, you can prepend their name with a word, then followed by a / and finally the branch name which is automatically defined by the CI_BUILD_REF_NAME variable.